KOKOMO, Ind. — Indiana University Kokomo students in the School of Nursing and School of Business were recently inducted into honor societies, rewarding their academic excellence. 2012 Sigma Theta Tau Alpha Chapter Nursing Induction. The School of Nursing inducted 11 senior nursing students into Sigma Theta Tau Alpha Chapter in recognition of their academic achievement, leadership, and demonstrated professional ability. Linda Wallace, dean of the nursing school, said it is a great honor to be selected for the honor society, which was founded by IU nursing students in 1922. "The society has a long history of providing leaders in the nursing profession, supporting student nurses and funding research to advance the career field," she said. Those inducted included Kyla Alexander, Laurie Allen, Mary Noreen Forgrave, Catherine Gentry-Wilkinson, Jessica Hartfield, Christine Morgan, Carol Smith, Shannon Talton, Kristina Thorne, Kellie Turner, and Natasha Virjee. 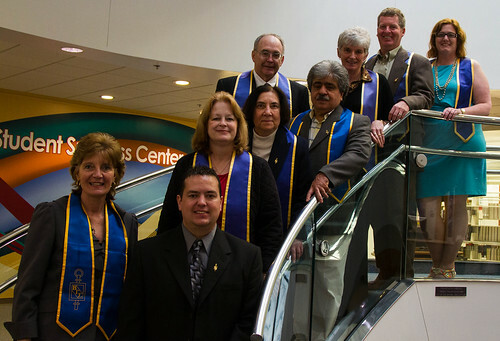 The School of Business inducted seven students into Beta Gamma Sigma business honor society. Beta Gamma Sigma Induction. View Flickr slideshow. David Rink, professor of marketing, said undergraduates must be in the top 10 percent of their class to be inducted, while graduate students must be in the top 20 percent. He noted that many of those chosen have 4.0 or 3.9 GPAs. "These are truly the best and the brightest future leaders in business," he said. Rink said Beta Gamma Sigma has a mission of encouraging and rewarding academic achievement in business, and promoting high standards for business leaders. IU Kokomo's new members include undergraduates Alexander Buckler, Justin Shacklee, and Adam Tussinger. Graduate students selected were Launa Bills, Thomas Crist, Aaron Greer, and Subramaniam Servai.